If you have nasal congestion, facial pressure, cough and thick nasal discharge, you may have rhinosinusitis, commonly referred to as sinusitis. Your sinuses are hollow cavities within your cheekbones, around your eyes and behind your nose. They contain mucus, which helps to warm, moisten and filter the air you breathe. When something blocks the mucus from draining normally, an infection can occur. Acute sinusitis refers to sinusitis symptoms lasting less than four weeks. Most cases begin as a common cold. Symptoms often go away within a week to 10 days; but in some people, a bacterial infection develops. Chronic sinusitis, also referred to as chronic rhinosinusitis, is often diagnosed when symptoms have gone on for more than 12 weeks, despite medical treatment. People with allergic rhinitis or asthma are more likely to suffer from chronic sinusitis. This is because the airways are more likely to become inflamed when allergic rhinitis or asthma are present. Sinusitis may also be caused by an infection, a fungus, deviated nasal septum, nasal polyps or in rare cases an immune system deficiency. Endoscopic sinus surgery is a surgical procedure used to remove blockages in the sinuses. These blockages can cause sinusitis, in which the sinus mucous membranes swell and become blocked, causing pain, drainage and impaired breathing. 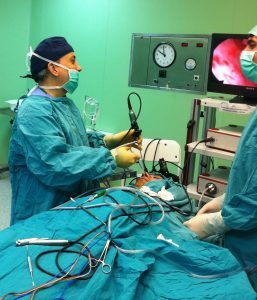 Usually under general anesthesia, a surgeon will use an endoscope, a thin camera rod with a light at the end, to provide visualization and magnification of the sinus tissues. Specialized instruments can be used to safely and effectively remove causes of sinus blockage like natural blockages, nasal polyps and scar tissue. Specialized instruments are also used to straighten the septum and reduce the size of the turbinates if required. Endoscopic sinus surgery does not involve cutting through the skin, as it is performed entirely through the nostrils. Therefore, most people can go home the same day.